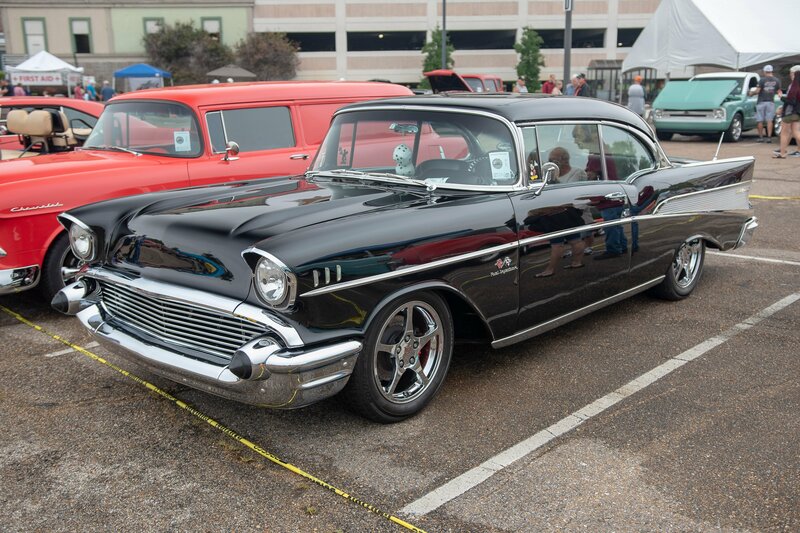 The weather wasn’t very kind to the 19th Annual Delta River Cruisin’ 2018 car show hosted by the Memphis Street Rods at Sam’s Town Casino and Resort in Tunica, Mississippi. But, that didn’t stop the faithful from making their annual pilgrimage to the huge casino parking lot to show off their ride and hang with friends — water droplets, dirt, and all! A bad forecast is not going to put a damper on these hard-core enthusiasts. The Memphis Street Rods car club has been in existence since 1968 — if you do the math folks, that is 50 years! Its big annual car show, Delta River Cruisin’, has become a mainstay for many hot rodders around the region, and some from beyond that. The show has been knocking on the door of 1,000 cars for a couple of years. We thought this might be the year, but Mother Nature had other plans and threw a nasty, unpredictable weather pattern over the Mid-South area. After a blistering Friday, rain crept into the area that afternoon and into the evening. With the rain that was predicted, this person came prepared with surfboards. We like his style! Late September can surely be crazy in the Delta, and as everyone crawled out of bed Saturday morning, they found drying streets and heavily overcast skies. Some folks abandoned ship after Friday’s storm rolled through, but for the stalwarts who stayed, they were greeted with — dare I say — a cool crisp morning. I’m not lying either . . . I’m talking light jacket kind of weather, which is unheard of this time of year. Wipe ‘em down and shine ‘em up folks, we’re going to have a car show! The Memphis Street Rods is heavily affiliated with the Nationals Street Rod Association (NSRA) and their mantra is to DRIVE THEM, so that is just what folks did. By the way, Memphis Street Rods has been involved with the NSRA (founded in Memphis) since its inception and has the distinction of being the only street rod club to work every NSRA Street Rod Nationals (now held in Louisville, Kentucky). That is pretty cool and lends to the nostalgia of the event, and the region as a whole, which is steeped in hot rodding history. While we don’t know the official count of cars for the show, our estimate was around at least 600 cars that remained on Saturday, which is pretty awesome given the forecast. Hey, when there’s $10,000 in cash and prizes being given away, why would you leave? Your car is already wet and/or dirty, so stick it out and have some fun with your friends, right? There is always time to clean your car, but never enough time to hang with friends! The show at Sam’s Town has always had a terrific family atmosphere and it’s not uncommon to see a 90-year-old sitting right next to a 9-year-old, and total strangers becoming friends after parking next to each other. Dads with daughters, moms with sons, friends with friends — it’s what car shows are all about. It’s not about the trophies. As a matter of fact, they only give away a few special awards to honor past members — the focus is on having fun with cars — and they figure you’d rather have cash anyway. Delta River Cruisin’ never disappoints with games, vendors, music, and camaraderie galore. It’s definitely a formula you can’t dispute. Trent Goodwin of Comp Cams didn’t bring HIS car to the event, but he brought his daughter’s new build. An awesome ’32 Ford roadster complete with working head and taillights, leather interior, and even a horn! You have to see it to believe it. This is the coolest stroller on the planet! Way to start them young, Trent! We’re sure the dates are already set for 2019, so look for information on Memphis Street Rods website, it’s traditionally the fourth weekend in September. Tell your friends and bring them along for the ride. You will have a great time, no matter what Mother Nature decides. Oh, by the way, we hear she’s not invited next year, so clear your calendar! We know many of you live too far away to attend the event, so we put together this big photo gallery for you to peruse. We hope you like it. Tell us what you’e favorites are. And if you can make it next year, tell them we sent you! We guarantee a good time!